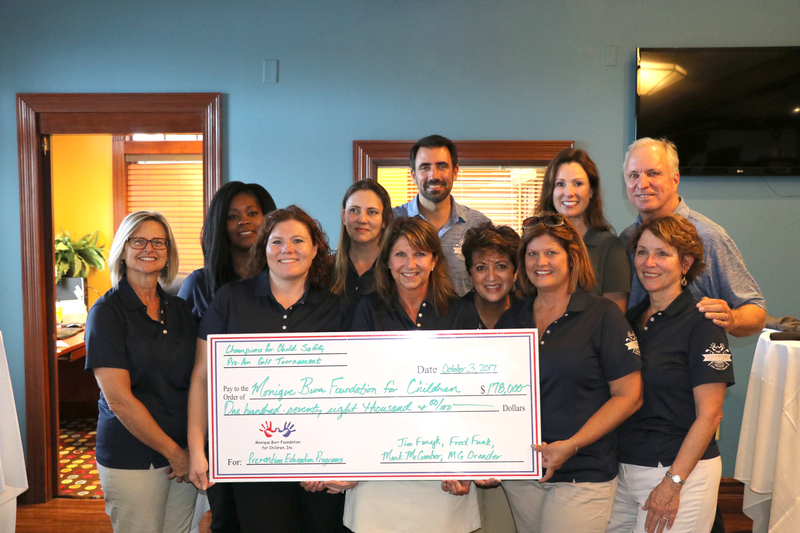 Thank You for Helping Raise $178,000 at the 20th Annual MBF Champions for Child Safety Pro Am Golf Tournament! We’d like to extend a huge thank you to all the Pros and amateur golfers, sponsors, and donors who participated in the 20th Annual MBF Champions for Child Safety Pro Am Golf Tournament presented by Lennar! Because of your participation in this year’s tournament, the Monique Burr Foundation for Children was able to raise $178,000 in funds that will go towards helping better protect children from bullying, cyberbullying, and all forms of child abuse! Along with honorary chairs Fred Funk, Jim Furyk and Mark McCumber, an additional 25 Pros participated in the tournament alongside 100 amateur players at The Palencia Club in beautiful St. Augustine. Participants had a great time making their way along Palencia’s beautiful course, stopping for refreshments at beverage and chef stations along the way. Players also had the chance to participate in a pre-event putting contest, 6 hole-in-one contests, and the $1 Million Shoot-Out. Once the tournament concluded, players returned to the clubhouse for food, drinks, and the closing ceremonies. MBF Founder Ed Burr shared a few words about the foundation’s history, the positive impact that MBF Child Safety Matters has had on children around the state of Florida and beyond, and how each player has become a Champion for Child Safety by participating in the 20th annual tournament. Ed then played a very special video featuring Lt. Lakesha Burton’s story of survival to help drive home the point that prevention education is extremely important in the fight against bullying, cyberbullying, and child abuse. After Ed finished speaking, Spencer Calvert with Pineapple Corporation joined Development Director Paul Woods in talking about the Monique Burr Foundation for Children’s Champions Club, a new annual giving initiative. Spencer shared a heartwarming story of being inspired to become a member of the Champions Club after seeing his 9-year-old son return home from school with a backpack tag of the 5 Safety Rules on the very same day he heard Lt. Lakesha Burton speak at last year’s Pro Am Golf Tournament. He said that her story of surviving and thriving after enduring child sexual abuse truly inspired him to do all he could to help protect children. The program concluded with the announcement of this year’s winning teams, both net and gross, and the presentation of their trophies. Congratulations to all! We can’t wait to see you on the course again next year! To check out photos from this year’s event, visit our 2017 MBF Champions for Child Safety Pro Am Tournament Album on Facebook!